Warren Bennis is the perfect example of what you would call a business guru. He is distinguished professor of business administration and founding chairman of the Leadership Institute at the University of Southern California's Marshall School of Business. He has advised four U.S. presidents and more than 150 CEOs and is author or coauthor of more than 20 books on leadership, change, and management. Rather impressive indeed! "Somehow I believe that the search for balance, though deeply felt and not to be dismissed, is chimerical. We just don't do one thing at a time anymore. We multitask in the car, with a latte, with a phone, a fax machine...and we floss." "How do we keep our eyes and ears open to nascent and potential disruptive inflection points? How much does sheer luck play a part or are executives just not up to the warp speed nature of change and if so, why? Or wjy is it that we're witnessing this tsunami of senior executive churning?" Working 24/7, like a dog, will inevitably lead you to the litmus question: After all, is this all there is? Here is what Bennis says about the effects its planned IPO may have on Google: "The IPO will no doubt roil Google's culture. If, as predicted, the IPO makes millionaires of 10 percent of the staff, then many will probably quit their jobs. Collegiality will be harder to sustain in a company in which some are millionaires and many more are not. As to the competitive threat that Google faces from Microsoft and Yahoo!, everything I know about Great Groups tells me that taking on some Goliath-like competitor will only energize Google's engineers. What may be more threatening than competition to Google's long-term prospects is the relatively short half-life of Great Groups. For the most part, these intense collaborations last only as long as the project. Even obsessed geniuses burn out. Once the bomb is built, or the PC is invented, the members of the group suddenly realize that they have been working 20-hour days for a long time, and they can't remember the last time they petted the dog or ate a meal with their children. Suddenly, work that seemed like play isn't fun anymore." In any case, if you still have a few hours to spare, do not hesitate invest them in Bennis's wisdom! French publishing icon goes English! Believe or not, the famous French "Que Sais-Je?" books have embraced English! The "Que Sais-Je?" collection was founded in 1941 by Paul Angoulvent and published by the Presses Universitaires de France (PUF). The collection counts roughly 1600 books and has sold 160 million copies worldwide. Angoulvent's bright idea was to convince respected scholars to author "mini" encyclopedic books that give a pretty accurate picture of a given field in less than 120 pages. The success has been impressive indeed and the books have been translated in more than 40 languages. What is new with the newly released book by my former colleague at Groupe HEC, Professor Michael Rockinger is that for the first time, Que Sais-je? publishes a book, namely Investments, directly in English without going through a translation from the French. Admittedly, Michael is a German, who works in Switzerland, studied in the US, taught in France and married an Italian. Truly cosmopolitan indeed! The PUF must have felt that he was the right pick for this first experiment. What remains to be known at this stage is whether this a one shot only or whether this a new line of development for the PUF. To be sure, the guards of the French language won't be long before reacting! In any case, what is truly revealing in all this, is that Rockinger's book is a book about finance, another vivid proof that finance is global indeed! 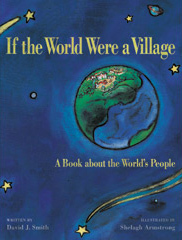 Two years ago I bought a nice and inspiring children book for my daughter: "If the World Were a Village" by David J. Smith (published by Kids Can Press, Toronto, Canada). While surfing on the Net, I just bumped into a sequel to Smith's book written by Donella Meadows. Dr. Donella H. Meadows (Ph.D. in biophysics, Harvard University), the founder of the Sustainability Institute, was a professor at Dartmouth College, a long-time organic farmer, a journalist, and a systems analyst. She was honored both as a Pew Scholar in Conservation and Environment and as a MacArthur Fellow. For 16 years Donella wrote a weekly column called "The Global Citizen", commenting on world events. It appeared in more than twenty newspapers, received the Walter C. Paine Science Education Award in 1990, and was nominated for a Pulitzer Prize in 1991. That list accounts for the mother tongues of only half the villagers. The other half speak (in descending order of frequency) Bengali, Portuguese, Indonesian, Japanese, German, French and 200 other languages. One-third (330) of the 1,000 people in the world village are children and only 60 are over the age of 65. Half the children are immunized against preventable infectious diseases such as measles and polio. Just under half of the married women in the village have access to and use modern contraceptives. This year 28 babies will be born. Ten people will die, 3 of them for lack of food, 1 from cancer, 2 of the deaths are of babies born within the year. One person of the 1,000 is infected with the HIV virus; that person most likely has not yet developed a full-blown case of AIDS. With the 28 births and 10 deaths, the population of the village next year will be 1,018. In this 1,000-person community, 200 people receive 75 percent of the income; another 200 receive only 2 percent of the income. Only 70 people of the 1,000 own an automobile (although some of the 70 own more than one automobile). About one-third have access to clean, safe drinking water. Of the 670 adults in the village, half are illiterate. · The woodland is declining rapidly; the wasteland is increasing. The other land categories are roughly stable. The village allocates 83 percent of its fertilizer to 40 percent of its cropland - that owned by the richest and best-fed 270 people. Excess fertilizer running off this land causes pollution in lakes and wells. The remaining 60 percent of the land, with its 17 percent of the fertilizer, produces 28 percent of the food grains and feeds 73 percent of the people. The average grain yield on that land is one-third the harvest achieved by the richer villagers. The village has a total budget each year, public and private, of over $3 million - $3,000 per person if it is distributed evenly (which, we have already seen, it isn't). The village has buried beneath it enough explosive power in nuclear weapons to blow itself to smithereens many times over. These weapons are under the control of just 100 of the people. The other 900 people are watching them with deep anxiety, wondering whether they can learn to get along together; and if they do, whether they might set off the weapons anyway through inattention or technical bungling; and, if they ever decide to dismantle the weapons, where in the world village they would dispose of the radioactive materials of which the weapons are made." This rescaling of the world may seem futile and, as any averaging exercise, may distort the true facts and figures. It is a useful exercise though if I can judge from the reactions of my daughter. Her attention got attracted to issues she would not have raised so easily. Now the question is, if the world were a village of 1000, how many of them would be bloggers? "conventional wisdom in the auto industry, for example, is that a company needs to sell four million cars per year just to stay in the game....Why have the stakes risen so dramatically? Today, even the automobile industry is driven more by the economics of idea than the economics of physical production. car companies need to be bigger than ever, because they face huge costs in brand marketing, in entering difficult new markets, and in developing new technology." This is indeed one of the salient features of the new economy which in turn implies,as we have noted in earlier posts on this blog, a rather atypical cost structure: The first unit is very costly to produce while the others are not. The new economy has far-reaching implications. Indeed, while nobody will complain about the fact that growth and prosperity are driven by ideas, one may nevertheless worry that a perspiration/inspiration divide is in the making: Perspiration is outsourced to poor or less developped countries while inspiration becomes the privilege of developped countries. This trend creates tensions, economic, social and political, that may reveal hard to solve.